If you can conjure a Diane Arbus photograph from memory, it might be the identical twin girls, the skinny boy clutching a toy hand grenade, the “Jewish giant”. But you are recalling the Arbus canon as defined by “Diane Arbus: An Aperture Monograph”, the record-breakingly bestselling volume which, along with a 1972 MoMA retrospective, cemented her celebrity. There is more: in a box which lay largely undisturbed in Arbus’s studio until ten years after her death in 1971, a range of 35mm works from her early career survived. A new exhibition at the Met Breuer (in a building on New York’s Upper West Side formerly home to the Whitney) presents this early work. The photographs are all from a strict seven-year period beginning in 1956, the year that Arbus wrote “roll #1” on some film. 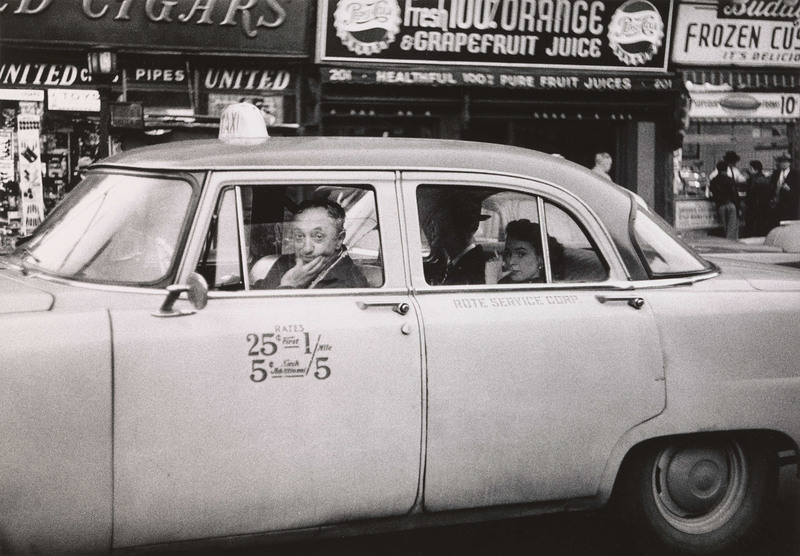 Arbus’s themes in this period are familiar from her more famous works. In dramatic black and white, she photographs people on the street who do not smile. She obsessively prods at the moment of seeing, or being seen. Arbus frames for us cinema projections but also television screens, waxworks made for display and people who do not know they are being watched. We see secretaries in picture windows and sleeping children; beautiful people with direct stares, labelled “female impersonator”. 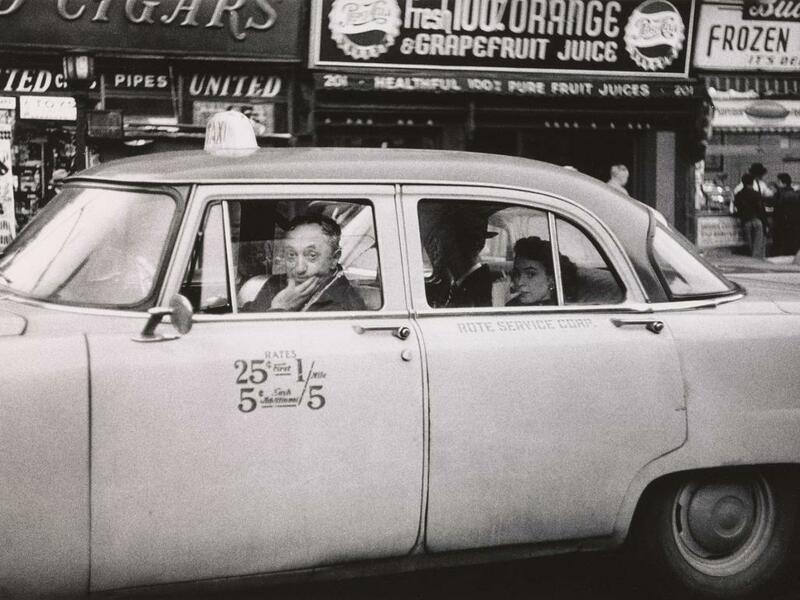 Arbus’s photographs hold but resist your gaze like an unfriendly stranger. The Met Breuer show has no sequence. Silver gelatin prints float on individual floor-to-ceiling panels. 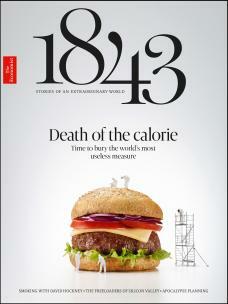 The images hang at the eyeline of an average-sized American woman. Some panels have Arbus quotations written on them like, “I don’t press the shutter. The image does. And it’s like being gently clobbered.” The lettering is about ten feet in the air, so these messages don’t clobber the viewer so much as hover remotely, as if shy of being noticed. I went to a press opening of the show on a Monday morning. Most of the other attendees were older, and they talked a lot. They said things to each other like, “I wish I’d bought ten of these in 1972,” and, “Hey, you’re still alive.” There were some younger people, not many. But we made sense as a group drifting between those floating panels, and we seemed to leave time temporarily, suspended among the black and white. The press became a group of anonymous witnesses, looking at each other looking at images of looking, images of being looked at. Some of us even took photographs of each other looking at the photographs. I think Diane Arbus would have liked that. This street portrait – in the style of one of her key influences, the German photographer August Sander – indicates the direction of much of Arbus’s most famous later work. The subject is simple, just a person just walking down the street, and yet her look is so 1950s that it now seems like it’s from a period film. 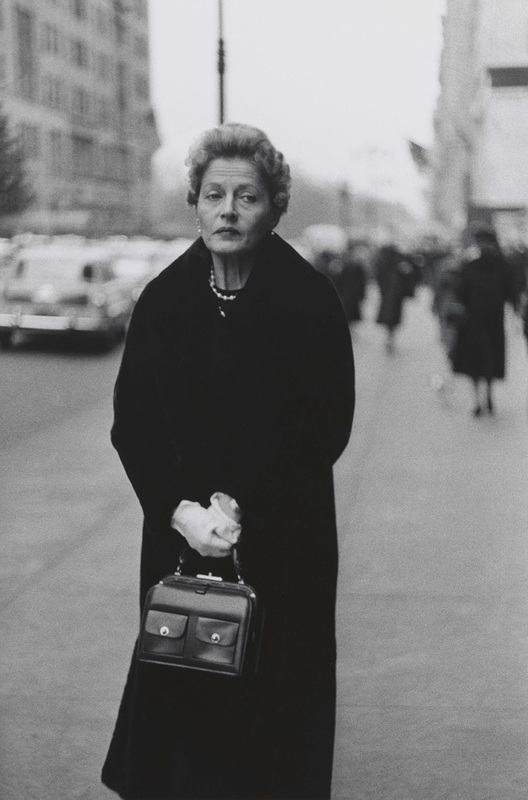 Arbus’s dramatic framing and the woman’s troubled expression add to the image’s ambiguous, movie-like texture. 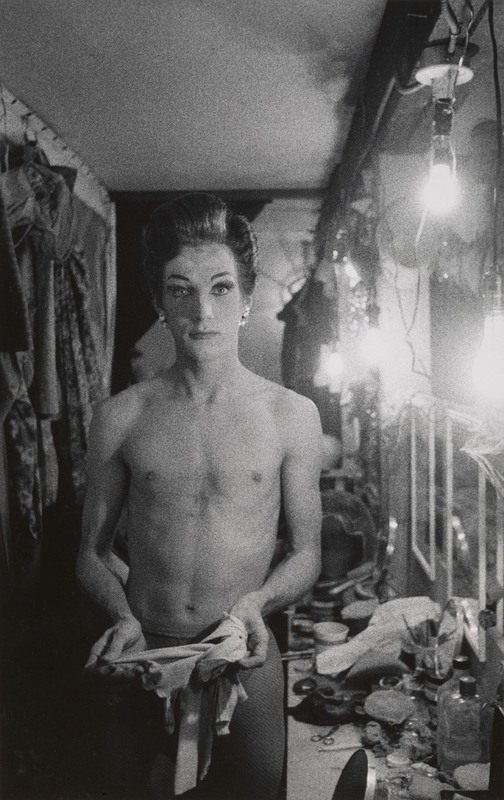 Arbus photographed many “female impersonators” in Long Island. She also photographed drag balls and queer club life of many kinds. The MoMA photo librarian Yuben Yee recalls in the 1960s having to wipe spit off her “female impersonator” shots every morning. Arbus’s best known works are of children and women, but her interest in so-called sexual deviance was longstanding: some of Arbus’s portraits of gender non-normative individuals like the performer above date back to 1957, and they are among her gentlest and most personal portraits. This portrait of a female performer is so interesting beside the “female impersonator” shot. In contrast to the hyperactive dressing-room decor above, her surroundings are stark and sharp, almost threatening. The wall looks like it is splintering. Her soft flesh and and pale breasts look vulnerable. But her expression is unyielding, her body language confident. She defies the camera by becoming unreadable. Taxi drivers and their passengers have something in common, because they’re in the same vehicle, but they’re divided by a transactional barrier that gives them completely different identities. Seen from the outside, however, the New York City cabbie and his fares resemble each other. Old or young, driver or passenger, the inhabitants of New York are individuals navigating a megacity the best they can, collaborating on their journey but essentially, in the end, alone together. 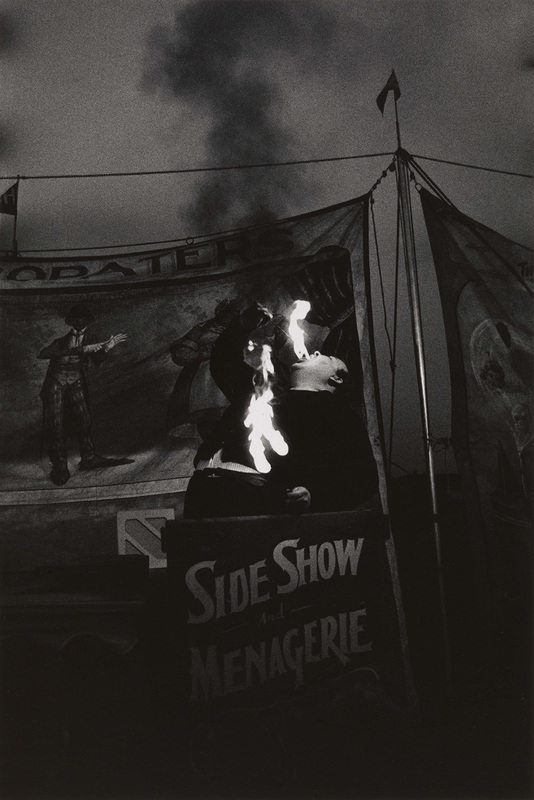 This fire-eater image is one of several carnival pictures Arbus shot over the course of 1957, alongside clowns and sideshow banners. This photograph may be the most dramatic and painterly of the Met Breuer show. The circus unites Arbus’s interest in popular entertainments – gurning cartoon characters and bad waxworks – with her concern for how human display themselves.